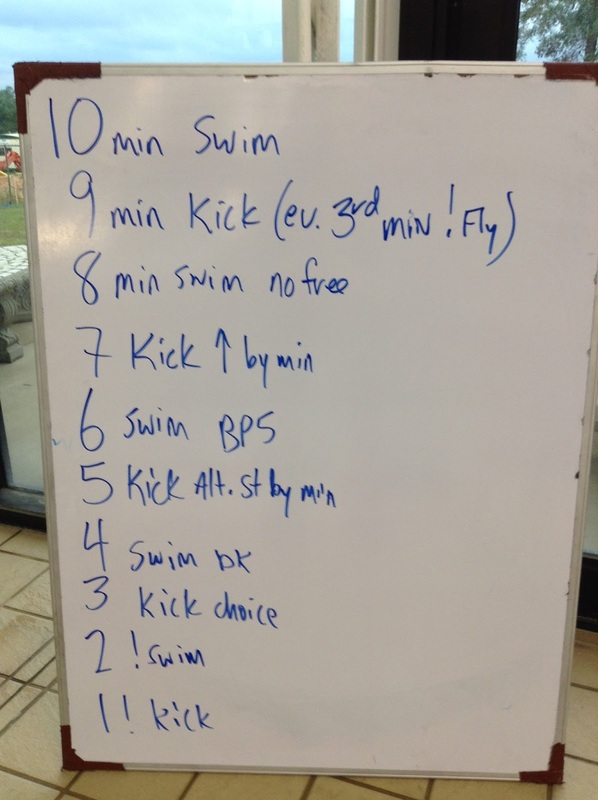 We did this one with our Senior groups combined with our top age group training squad. This was our first long course practice since winter training. I just wanted them to get their feel back for the long pool. They were pretty gassed after it. The set was deceptively hard for the swimmers. Most took off on the first round counting strokes and feeling good, only to be taxed by the 50s. We were not very successful on the descend on round two. They got back on it on round 3 and four. If we do this again, I might set some more specific times to hit on the 100s, but I was more focused on a good stroke count that wouldn’t fade under fatigue. We only have a one-hour practice on Friday evenings for our two 14&U groups. So we just put them all together and send them on this set. Everyone can do it and no worries about an interval. Just listen for the whistle and know what’s coming next!